You are here: microTOOL / Knowledge Base / What is the Kano Model? The Kano Model. A Means of Analyzing Customer Desires. What is the relationship between customer satisfaction and the characteristics of products or services? 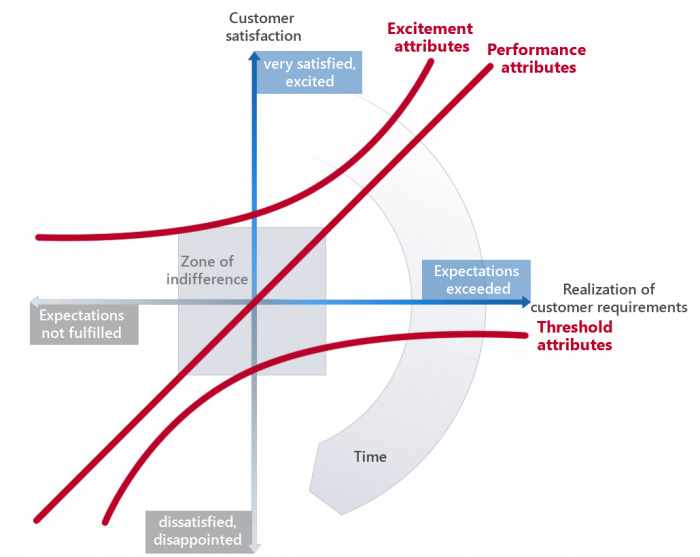 The Kano Model describes the connection between the realization of customer requirements and customer satisfaction. It is not possible to deduce an overall satisfaction level from the Kano Model. Different customer requirements are indicated by different lines. Excitement attributes are not expected by (potential) customers. Existing excitement attributes can lead to disproportionate satisfaction. Performance attributes are explicitely requested by customers and have direct impact on satisfaction or dissatisfaction. Example: High fuel consumption – dissatisfied customer; low fuel consumption – satisfied customer. The zone of indifference indicates an area in which expectations in requirements are more or less fulfilled. Outside the zone satisfaction and dissatisfaction respectively increase disproportionally. Threshold attributes are taken for granted; customers become aware of them only if they are missing. The have no effect on satisfaction levels but can cause dissatisfaction if missing. Example: passenger-side airbag. Over time, excitement attributes become performance attributes and subsequently threshold attributes. A good example is mobile technology or IT. Developing products can be a delight. Threshold attributes (Must-be qualities). These attributes are taken for granted when fulfilled but result in dissatisfaction when not fulfilled. Customers expect these attributes and view them as basic; it is unlikely that they are going to tell the company about them when asked about quality attributes. Performance attributes (One-dimensional qualities). These attributes result in satisfaction when fulfilled and dissatisfaction when not fulfilled. These are attributes that are spoken and the ones in which companies compete. If they are excelled customer satisfaction increases accordingly. Excitement attributes (Attractive qualities). These attributes provide satisfaction when achieved but do not cause dissatisfaction when not fulfilled. They are not normally expected and thus often unspoken. Indifferent qualities. These aspects are neither good or bad and have no effect, positive or negative, on customer satisfaction. Reverse qualities. If these aspects exist they lead to dissatisfaction; if they do not exist they do not lead to satisfaction. It is not possible to deduce an overall satisfaction level from the Kano Model. The Kano Model originates from the two-factor theory by Frederick Herzberg. It states that there are certain factors in the workplace that cause job satisfaction, while a separate set of factors causes dissatisfaction. The two-factor theory distinguishes between motivators and hygiene factors; according to Herzberg, hygiene factors are what cause dissatisfaction among employees in a workplace. In order to remove dissatisfaction in a work environment, these hygiene factors must be eliminated. Eliminating dissatisfaction is only one half of the task of the two factor theory. The other half is to increase satisfaction in the workplace. This can be done by improving on motivating factors. The must-be qualities of Kano correspond to the hygiene factors of Herzberg. The one-dimensional and attractive qualities correspond to the motivating factors. Customer expectations for characteristics and features of products, systems, solutions and software vary greatly. One feature may excite a customer while another person may take it for granted or even reject a product because of it. Thus, examples are not generally accepted. Why is the Kano Model important? It shows that different kinds of requirements can exist for products. What do customers expect? What increases satisfaction? How can companies differentiate themselves? How is it possible to excite customers as well as non-customers? What should be neglected? It shows that increasing the number of must-have qualities does not help to differentiate a company or product from competitors. One-dimensional qualities have direct impact on customer satisfaction. Attractive qualities are the best means of setting yourself apart in the competition. Since they are not expected by the customer they are difficult to ascertain. Also, not all first-to-market pioneers are successful. Investing in indifferent qualities makes no sense because they have no effect on customer satisfaction. Reverse qualities are to be avoided because they result in rejection and a bad company image. There is a temporal dynamic: Excitement attributes become performance attributes over time; performance attributes become threshold attributes over time. An example is the swiping technology for mobile devices; they used to excite many people but are expected today and do not increase customer satisfaction. There is also a reverse temporal dynamic: Threshold attributes become excitement attributes, e.g. catering on flights. Now you know the Kano Model – so what now? Do you want to understand correlations, find stakeholder goals or work with use cases? Working with pen and paper is one option; but the right tool supports your requirements engineering for systems and software professionally and effectively. Here you will find an overview of our knowledge pages. Do you already know our objectiF RPM whitepaper? Let us show you more knowledge in our webinars. Applying knowledge with the right tool: objectiF RPM. Receive up-to-date knowledge directly in your inbox. Find more interesting downloads here.